History was made at Wimbledon yesterday. On a day which saw court-side temperatures reach nearly 50C, Andy Murray from Scotland became the first British Men’s singles champion at Wimbledon since Fred Perry in 1936. Andy Murray holding the Wimbledon Men’s trophy, ending the 77-year wait since Fred Perry in 1936. It was a captivating match. The first game lasted over 10 minutes, with Murray having 3 break points. It was a portend for how closely fought the match would be. Although Murray won in 3 sets (6-4, 7-5, 6-4), nearly every point was keenly contested, and very few games were won easily by either player. Murray needed every ounce of his strength and fitness to overcome his Serbian opponent. During each change of ends both players sat under parasols held by ball boys with ice cubes wrapped in towels around their necks to counter the heat. Long before the end of the first set, Murray’s shirt was drenched in sweat, but his years of dedicated conditioning had prepared him well for such energy-sapping conditions. Not surprisingly, even after losing the first set 6-4, Djokovic was far from out of the match. The Serb went into a 4-1 lead in the 2nd set, but Murray fought his way back to take it 7-5. But still the World number 1 was not beaten. He went into a 4-2 lead in the 3rd set, but again Murray was able to haul him back. Murray broke Djokovic to serve for the match at 5-4, and after failing to convert 3 Championship points Murray finally sealed the historic victory when Djokovic’s shot went into the net. My parents, 79 and 78 years old, do not even remember the last time a man from Britain won Wimbledon. That is now long ago it was that Fred Perry won! 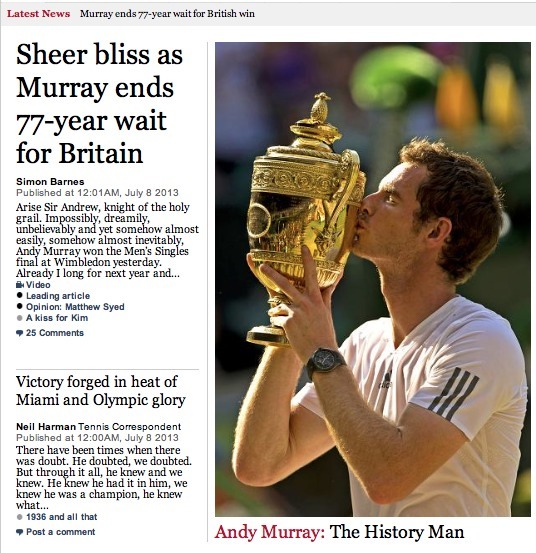 One of the most tantalising questions now is how many Major titles can Murray go on to win? How many times can he win Wimbledon? Many tennis greats believe he could win half a dozen or more. We shall have to wait and see. All the newspapers in the DUK have Andy Murray on the cover. The cover of the Daily Mirror.